Home is where the heart is. That’s why it’s no surprise that some seniors are choosing to age in the place where they raised kids, doted on grandchildren, and enjoyed some of the best memories of their lives. But aging in place can create challenges, especially when it comes to doing routine tasks like cooking, laundry, housekeeping, errands, or even grooming and dressing. To help, the Nathaniel Witherell recently launched Witherell at Home, non-medical home care services for seniors who are either aging at home, or are recovering from an injury or illness. “Witherell at Home was created to give family and caregivers peace of mind. They know their loved ones are safe and getting the help they need at home,” says Allen Brown, Executive Director of The Nathaniel Witherell. While aging in place might not work for everyone, it can work for some. Here we offer tips for seniors and their families on what to consider, and what to do to ensure that loved ones age in place safely. Safety should be at the top of the list, and physical comfort for the elderly might require some home modifications. Assess the home’s layout. Although we might be fond of area rugs, staircases, and claw foot bathtubs, those features pose falling risks. “Once any health or mobility issues are identified, your home should be adapted to minimize any hazards,” notes Brown. Seniors who age at home will also need regular, healthy meals and meal preparation might become challenging. “Families should be attentive to their loved one’s nutrition. Are they eating regularly? Are they able to use the stove or toaster oven safely? If you’re noticing that food in the fridge stays there, it might be time to reconsider your decision,” advises Brown. 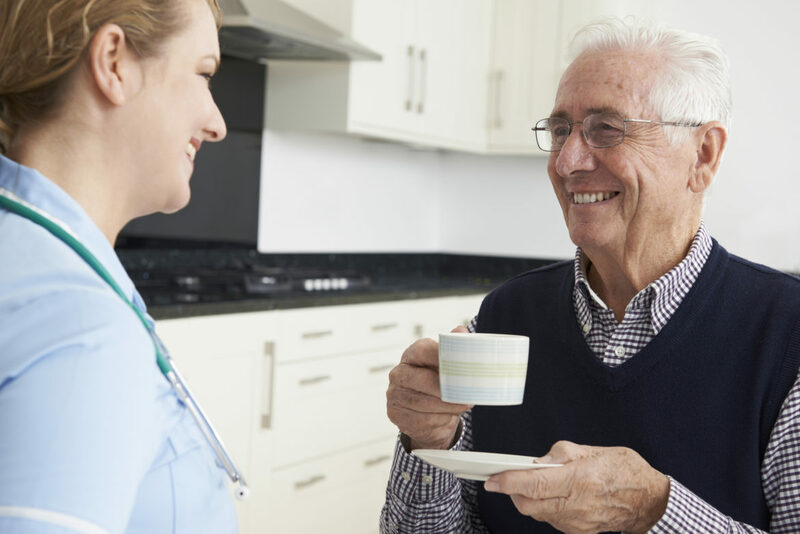 As Brown notes, the experts at Witherell at Home are available for in-home consultations to help families understand and prepare for all aspects of home care. For an in-home consultation, call 203.618.4259. Beyond physical comfort, research shows that social and emotional connections can impact health and well being, especially among the elderly. A new study out of the University of California-San Francisco linked loneliness in the elderly to functional decline and even death. “Isolation should be of concern and that’s where the at-home caregivers available through Witherell at Home can also be valuable. Not only do they perform physical tasks, they provide companionship. They can keep seniors involved in the outside world by taking them to recreational activities, to the hairdresser, or even to restaurants or stores,” says Brown. If aging at home seems like the best choice, Brown advises caregivers to monitor the arrangement regularly. “If you notice changes in grooming habits or weight loss, or suddenly see injuries or bruising from falls, those are telltale signs that your loved one might need to move to a skilled nursing facility,” says Brown.